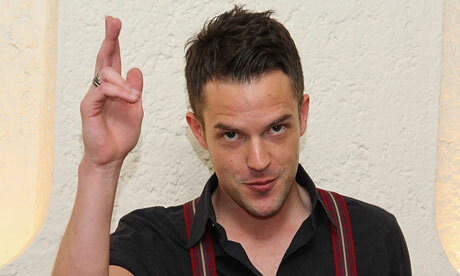 I've long been interested in The Killers' LDS front man, Brandon Flowers, and I am a big fan of their music. When they came onstage last night at UVU, I cheered pretty hard. I also sang, danced, screamed, stomped, pumped my fist in the air, and held my cell phone up in celebration. I don't know how my kids felt about seeing me that way. I like to get my money's worth out of a concert. But last night it was more than that. I felt very personally responsible that Brandon Flowers felt more love from the Utah crowd than from any other crowd ever in the history of concerts. We are, by and large, his Mormon homies. Every clap meant "I feel you," and every scream meant, "Stay true." We all need support in our struggle for salvation. I like to think Brandon Flowers and I are in this together. Because we are, and so is everyone. The stage was set. Fog machines on. Bottled water within reach. But the house lights were still on. "Eminence Front" played over the loud speaker. This kind of made me mad because that's the song I would walk out to if I were a rock star so now I can't because it will look like I'm just copying The Killers. Out they came. They didn't turn the lights off. I've only seen one entrance like it before in my whole life. It was the U2 Elevation concert in Vegas years ago. They came out in full light. You could see them and everyone in the whole place. It was awesome and startling. I loved it. I dare say Brandon Flowers was there and loved it too. Copy cat. The Killers opened with "Mr. Brightside." Pretty great start. I told my kids 3 things about the concert. 1) Always sing along. You will never get a chance to sing with the band again. You'll regret it if you don't. 2) If you hold on to your ticket, you can't get lost. 3) You should never feel scared, intimidated, or out of place at a concert because everyone there just loves The Killers as much as you do. I love the new Killers album, Battle Born. It sounds like a throw back to 80s hair bands to me. "Runaways"="Here I Go Again" by Whitesnake. I recognize that Brandon Flowers is handsome and has a lot of appeal for people. I agree, but to see him in concert is to witness a lanky-legged awkwardness that puts me in mind of Olive Oyl. He looks down when he sings, is little bow-legged and seems a bit self-conscious. I saw him years ago at Abravanel Hall before he had the gravitas to pull this off as well as he does now. It's interesting that he should be, I don't know--shy? I was so surprised to see how small he acutally is. I didn't realize he would be that little, or that handsome. He did seem somewhat awkward to me, but yet somehow cooler than anyone I have ever known. The whole concert I kept thinking, "I hope he feels a special connection to us because we are like him - we have a special bond because we are mormons." I so get this post. I love Brandon Flowers and I loved the concert. I loved his smile, his quirky moves and his music. I love his courage as he says he's a mormon and as he takes on Richard Dawkins and bears his testimony. I screamed with you for the same reasons--I loved the show but I wanted him to feel our love for him and I wanted it to strengthen him and make him want to stay true and solid. Too bad I didn't know where you were sitting (or standing). Maybe we could have met each other. Now if I can just see him perform his solo stuff in a smaller venue, my concert-going career will be complete. Love this, Kacy. And so cool that you could be there with your kids. You're the cool mom! Excellent review as always. I would read your column in Rolling Stone. I am amazed at the evolution of Mr. Flowers-if you compare the Mr. Brightside guy to the Miss Atomic Bomb guy, they are both delightful but SOOOO different, IMHO.I watched the Killers live on the MTV Music Awards back in--what, 2006?--and then compared it to their live performance on Colbert this year and tried to comprehend that it was the same guy. So weird. And so awesome. Sounds like the best FHE ever. Maybe he'll come to Bozeman someday...bwahahahaha.